4.4 out of 5 based on 88 bloggers and 28 commenters. 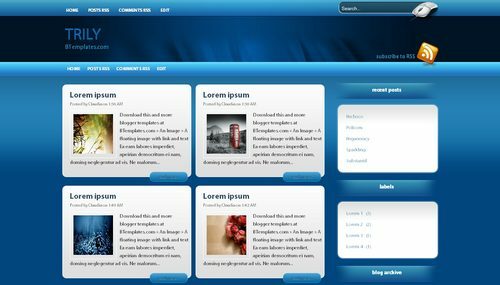 Trily is a free blogger template adapted from WordPress with 3 columns, magazine-styled, right sidebar, rounded corners, posts thumbnails and abstract. como puedo cambiar el tamaño de la imagenes miniaturas que aparecen en la portada?? Las variables corresponden al alto y al ancho de las miniaturas (en píxeles), respectivamente, y tienes que modificar sus valores. thanks for this template! the color is nice! but how can i put the menus on it? i cant find the the home, post rss and comments rss in the html, that’s why i cannot edit the menus, pls help! tnx…and also i cannot edit the header..
@sajang: If yo go to Layout/Page elements you will find two link list gadgets (above and under the header) where you can add your own links to set up the menu bars. AMIGA CLAUDIA, EN NINGUNA VERSION DE IE ?? NI LA 8 ?? Me gustaría tener éste pero que las entradas saliesen normales, una sobre otra. ¿Cómo puedo editar esto? how do you make youtube videos appear on the main page like the thumbnails? Gracias por esta plantilla Claudia. Ahora vamos a tratar de personalizarla. Excelentes tus trabajos! É bonito, mas não me serviu muito. Claudia te felicito por tan excelente, plantilla te auguro mucho exito en este ambito. Ademas te doy las gracias puesto que me vino como anillo al dedo para una especie de catalogo que quiero hacer. looks nice. i would try it out. by the way… what are you guys talking about? i only understand a bit since i was small i watched la usurpadora, la intrusa, maria mercedes, mis tres hermanes, betty la fea (my favourite) and the list goes on and on…. <3 telenovela very much! The previous lady has right. how to put linkwithin inside the blogspot? i tried but it does not come out well.